Minibar - The minibar is always visible and helps you navigate Brightspace Learning Environment. My Home - Returns you to your organization's homepage. You can usually find important information from your organization on the homepage. Course Selector - Use the course selector to access your courses. For easy access, you can pin your courses to the top of the list. Messages - Notifies you about unread mail and instant messages from instructors and other learners. Updates - Notifies you about new and updated announcements, due dates and end dates, and grades. Subscriptions - Notifies you about new blog posts, subscribed discussion forums, topics, and threads. Username - Allows you to make changes to your user profile, notifications, account settings, and log out. 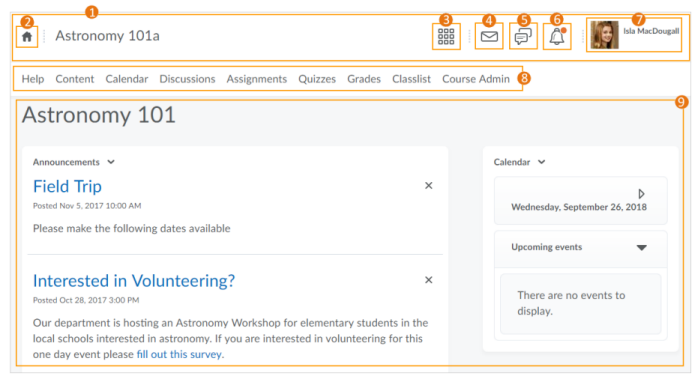 Navbar - Provides links to course-specific tools, for example, Discussions, Assignments, and Quizzes. The navbar may change depending on your course. Course Homepage - Provides quick access to important information related to the course, for example, announcements and calendar items. The course homepage for each course may be different.